Welcome to one of South Boston's newest buildings: Washington Village! Yet another string in a long line of new properties to grace this up-and-coming neighborhood, Washington Village is nestled in Andrew Square, stretching from Old Colony Avenue to Dorchester Avenue. As an eight-building development, Washington Village will comprise 656 apartments and condos, with construction slated for summer of 2017. Located close to public transportation, this area makes it easy to commute to and from the city, while having quick access to the neighborhood's restaurants, bars, shops, schools, and businesses. Geared toward first-time home buyers, renters and long-time area residents, Washington Village aims to bring together a diverse mix of singles, couples, and families. Built on the site of a now-defunct industrial cluster, this community-based development will breathe new life into a neighborhood that has been forgotten in recent years. Situated in the Andrew Square neighborhood, this development will replace five industrial buildings that are currently empty. One business -- Drive In Paint-Mart on Dorchester Street -- is still active, but will be relocated to accommodate the new development. There are three phases of construction as part of the development plan, with ground breaking occurring this summer. Total construction time will take five years from inception. Developers hope to bring back the economic vitality of Andrew Square, something that has been lost over the years. South Boston is becoming the place to live for young up-and-comers, budding professionals, and young families. Washington Village hopes to keep that trend going with the addition of these new units. Creating an additional 1,200 jobs, the Washington Village project will transform the area into a walkable neighborhood, making it easy for residents to stroll along the streets to access quality dining and entertainment. Long before it was Washington Village, this area was discovered by Native Americans who called it Mattapannuck. Originally used as an orchard and pasture in Colonial times, a village was eventually created and named Little Neck. In 1850, it was renamed Washington Village in honor of George Washington, the Commander-in-Chief of the Continental Army. As the town became more and more industrialized in subsequent years, it was renamed yet again in honor of John Andrew, the governor of Massachusetts during the Civil War. Today, the effort to bring back the original name it had for so long is currently underway. The goal is to enhance and transform this South Boston neighborhood into a thriving community of green spaces, new trees, community gatherings, homes and new places to shop. 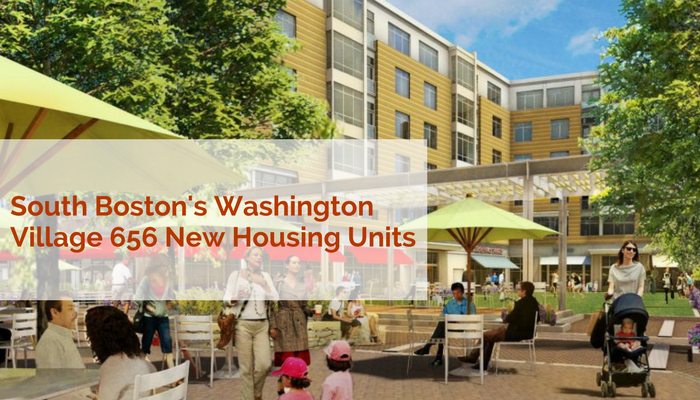 Call Elevated Boston at 617-701-6300 or email us at info@elevatedboston.com to learn more about Washington Village. Get in now before the units go fast!